Meningitis - body, last, viral, contagious, causes, What Is Meningitis? Meningitis (meh-nin-JY-tis) is an inflammation of the membranes that surround the brain and the spinal cord (the meninges, meh-NIN-jeez). Meningitis is most often caused by infection with a virus or a bacterium. Meningitis is an inflammation of the meninges, the membranes that enclose and protect the brain and the spinal cord. It is usually caused by infection, most often with viruses or bacteria. Meningitis caused by bacteria is known as septic meningitis. Meningitis caused by other organisms, including viruses, fungi, and parasites, is called aseptic (a-SEP-tik) meningitis. Viral meningitis is the most common and mildest form of the disease, and most people fully recover from it without complications. Bacterial meningitis, if not diagnosed early, can cause serious and sometimes fatal complications. Enteroviruses, a group of viruses that includes several strains of coxsackieviruses (kok-SAH-kee-vy-ruh-sez) and echoviruses, cause about 90 percent of cases of aseptic meningitis. Two types of bacteria that are most likely to cause septic meningitis are Streptococcus pneumoniae (strep-tuh-KAH-kus nu-MO-nye) and Neisseria meningitidis (nye-SEER-e-uh meh-nin-JIH-tih-dis), also called meningococcus (meh-NIN-guh-kah-kus). Before the introduction of a vaccine * in the 1980s to prevent infection with Haemophilus influenzae type b (Hib), the bacterium was a common cause of septic meningitis in young children. Meningitis can be caused by other pathogens * as well, such as some species of parasites and fungi and the bacteria that cause Lyme disease * , tuberculosis * , and syphilis * . Meningitis from these organisms is usually a complication of widespread infection throughout the body and is more likely to be seen in people who have immune problems or other diseases, such as those with AIDS * or cancer. Sometimes, chemical irritations, severe drug allergies, or tumors can lead to inflammation in the central nervous system * , resulting in meningitis. * vaccine (vak-SEEN) is a preparation of killed or weakened germs. or a part of a germ or product it produces, given to prevent or lessen the severity of the disease that can result if a person is exposed to the germ itself. Use of vaccines for this purpose is called immunization. * pathogens (PAH-tho-jens) are microorganisms that can cause disease in another living organism. * Lyme (LIME) disease is a bacterial infection that is spread to humans by the bite of an infected tick. It begins with a distinctive rash and/or flulike symptoms and, in some cases, can progress to a more serious disease with complications affecting other body organs. * tuberculosis (too-ber-kyoo-LO-sis) is a bacterial infection that primarily attacks the lungs but can spread to other ports of the body. 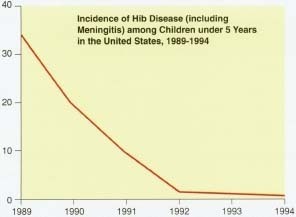 The rate of incidence of Hib-related disease, such as meningitis, decreased dramatically since Hib vaccination programs were started in 1989.
seen in young adults, particularly in college students who live in dormitories. Some forms of bacterial meningitis are contagious, but these are not easily spread (compared to germs that cause colds and the flu). Bacterial meningitis almost never results from simply being in the same room or building with someone who has meningitis. Only a small fraction of people who come in contact with these bacteria and viruses will actually develop meningitis. Bacteria that can cause meningitis are sometimes found in the throats and noses of healthy people. They are spread through direct contact with respiratory secretions (drops of fluid from the mouth, nose, or lungs). This means they can be passed to someone who kisses an infected person or to someone who touches the secretions from someone who is sneezing or coughing and then touches his or her own nose or mouth. Meningococcus can spread in this way through households, daycare centers, and college dormitories. * central nervous system is the part of the nervous system that includes the brain and spinal cord. * epidemics (eh-pih-DEH-miks) are outbreaks of diseases, especially infectious diseases, in which the number of cases suddenly becomes far greater than usual. Usually, epidemics are outbreaks of diseases in specific regions. whereas worldwide epidemics are called pandemics. Enteroviruses commonly are passed from person to person through contact with respiratory secretions, by breathing in drops from someone who is coughing or sneezing, and from contact with an infected person's feces (FEE-seez, or bowel movements). Symptoms of meningitis often include fever, headache, stiff neck and back, photophobia (painful sensitivity of the eyes to light), abnormal sleepiness, and confusion. Vomiting may also be seen. Infants' symptoms are not as specific as those in older children and adults but usually include irritability, lethargy, poor feeding, crying when moved, and vomiting. Infants may not have neck or back stiffness while ill with meningitis. Meningococcus can cause a reddish-purple rash (from bleeding under the skin) that rapidly spreads over the body. Seizures * can occur in anyone with meningitis, regardless of age. How Is Meningitis Diagnosed and Treated? A doctor will first ask questions about the illness, do a physical examination, and then perform some tests. The brain is sometimes viewed with a computerized tomography * (CT) scan to rule out other reasons for severe headache and illness, such as an abscess * , tumor, or other problems within the brain. A lumbar puncture (also called a spinal tap) is usually done to take a sample of the cerebrospinal (seh-ree-bro-SPY-nuhl) fluid (CSF), the fluid that surrounds the brain and spinal cord. The CSF will be examined under a microscope to look for bacteria or other infectious agents, and increased numbers of white blood cells indicating inflammation. Antibiotics are not used to treat viral meningitis because it is caused by a virus, not bacteria. Once a case of meningitis is known to be viral, rest and pain medication for body aches and headache can help the person feel better until the infection resolves on its own. Bacterial meningitis requires prompt medical treatment, usually in the hospital. Antibiotics are given to fight the invading organism for at least 2 weeks. Treatment of complications may require intensive care and other medications. Meningitis that results from other types of infection or other causes is treated with medications, such as antifungal or antiparasitic drugs, and may require hospitalization, especially during the early stages of medical care. Most cases of viral meningitis last 1 to 2 weeks, and most people recover completely. Symptoms from bacterial meningitis can last weeks, and people may have severe complications from the disease, especially if it is not diagnosed and treated promptly. What Complications Can Meningitis Cause? Complications from viral meningitis are not as common as those from bacterial meningitis, but they can include inflammation and swelling of the brain. Sometimes, permanent learning disability and other brain damage can result. * abscess (AB-ses) is a localized or walled off accumulation of pus caused by infection that can occur anywhere in the body. Complications from bacterial meningitis can occur rapidly and be severe, even with quick diagnosis and treatment of the disease. Complications include sepsis * , brain swelling, seizures, shock * , organ failure (such as of the kidneys * ), and death. Up to 15 percent of cases of meningitis caused by meningococcus are fatal. Long-term effects are seen in about 10 percent of those who survive bacterial meningitis and can include hearing loss, seizure disorder, learning disabilities, and other problems resulting from brain injury. Meningitis caused by the bacteria that cause tuberculosis is particularly likely to damage the nervous system. Vaccinations against Haemophilus influenzae type b and Streptococcus pneumoniae are now given routinely to American children before the age of 2. A vaccine against meningococcus is also available, although it is not regularly used in the United States and is not effective in young children. Young people going off to college, especially those who plan to live in a dormitory, should consider getting the vaccine, as recommended by the U.S. Centers for Disease Control and Prevention and the American Academy of Pediatrics. It also is recommended for people traveling outside the United States, people living in certain institutional settings, the elderly, and people with some chronic * medical conditions. During outbreaks of bacterial meningitis, especially those caused by meningococcus, in schools, dormitories, or daycare people may be given prophylactic * antibiotics to keep the disease from occurring in those who were in close contact with the infected person. It is difficult to keep viruses such as enteroviruses from spreading from person to person. Risk of viral infection can be decreased by washing hands regularly, especially after using the toilet, and avoiding close contact with anyone who is ill, including not sharing food, eating or serving utensils, razors, or other personal items. * prophylactic (pro-fih-LAK-tik) refers to something that is used to prevent an illness or other condition, such as an infection or pregnancy. Meningitis Foundation of America Inc., 6610 North Shadeland Avenue, Suite 200, Indianapolis, IN 46220. The Meningitis Foundation of America offers information about the disease, including prevention and treatment, at its website. U.S. Centers for Disease Control and Prevention (CDC), 1600 Clifton Road, Atlanta, GA 30333. The CDC is the U.S. government authority for information about infectious and other diseases. It provides fact sheets about meningitis at its website. How long does it take for a person with meningitis to lose their eyesight?